The last time you saw Dr. Thaddeus Eggheard Brain, believed by many to be the greatest living eccentric mathematical genius to date, you'd just been promoted to lab assistant in the dark and dusty basment laboratory of his castle in Castle of Dr. Brain. Only a short time before, in order to get hired for the job, you had encountered several of the trickiest and twistiest puzzles ever known. What does he have in store for you this time? Recently, while working very late in his lab, he was finishing the plans of his latest top-secret project. As he turned around to check a faint noise he heard, he was struck on the head with a large pink flamingo. As he gained conscience again, he discovered the plans of his project had been stolen. Fortunately he memorized them. Your first assignment is to recover a special battery, needed to operate Dr. Brain's new invention. This battery is located deep in Dr. Brain's private island. As you arrive on the island by parachute, you discover that the path to the battery is filled with tons of puzzles that need to be solved to proceed. And while some puzzles are similar than those you encountered in the castle, there are also a whole bunch of new ones, 26 in total! Time is of the essence. Can you unravel the puzzles and obtain Dr. Brain's battery before the burglar manages to steal the idea and put the secret device together himself? Island of Dr. Brain, designed by Patrick Bridgemon is, like its prequel, part of the Sierra Discovery Series, teaching kids to adults on various topics such as maths, language, literature, physics, chemistry and more. The game features three difficulty levels which can be altered throughout the game and a hint system, which of course reduces the overall score if used. Island of Dr. Brain greatly improved in replayability as the puzzles are far more randomized. In addition the die-hard gamers can play the game to such an extent that they achieve the ultimate score of 1,000 points and unlock the secret ending. Island of Dr. 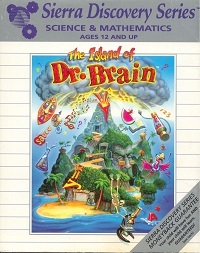 Brain was made for DOS, using Sierra SCI engine. It was later also re-released as a Sierra Original with partial speech.